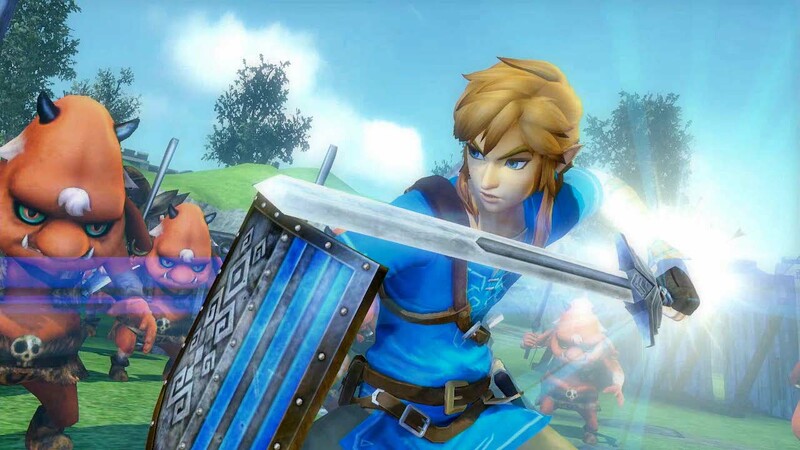 Hyrule Warriors was a game that came to the Wii U and mishmashes the gameplay of Koei Tecmo’s popular Dynasty Warriors franchise with the characters, locales and narratives of The Legend of Zelda series. The Nintendo Switch port is quite appropriately titled the Definitive Edition. Why is it called this? In one package it contains the Wii U game, the Nintendo 3DS enhancements that came in Hyrule Warriors Legends and every single piece of downloadable content that was released for both versions. But before that, let’s get into it. The gameplay is fairly simple. You get placed on a map with allies and armies and you have to complete a mission, typically to defeat the leader of the other army. You do that by taking the keeps on the map, defending your allies and then, eventually, defeating the leader. There are 29 different characters to play as, several of which have multiple weapons to use which make the character play like an entirely new one, giving the game a lot of variety. These characters can then be levelled up as you play through, making it easier to take down enemies and face off through the harder difficulties. You can also collect various materials from fallen foes to augment your character with stronger abilities in the Badge Market, so you can attack weak points quicker and other similar features. This will require a lot of time with the game, often grinding as the materials are random drops, to get the materials you may need to max out each character. Hyrule Warriors: Definitive Edition also features a mechanic continued on from Hyrule Warriors Legends where you could change between multiple characters in the map, allowing for you to be able to keep proper control of the area without needlessly having to run around the map continually. The game also has a local 2 Player Mode. Unlike the Wii U where one player used the Wii U GamePad and the other the TV, with a graphical hit, it is done through split-screen and doesn’t impact performance much if at all. The main narrative of the game comes in the Legend Mode. This has you play through a story where Hyrule comes into turmoil when the evil Cia and her minions cause rifts through space and time throughout the history of The Legend of Zelda series. Uniting with various characters including Darunia and Ruto from Ocarina of Time, Midna from Twilight Princess and Fi from Skyward Sword, among their adversaries, your task as Link is to find the Master Sword and try to stop Cia’s plan. As this is the Definitive Edition, it also includes the side story of Linkle, a young girl who believes she’s the hero of Legends, and, later on, the story of Link’s adventure with Tetra when the Great Sea merges with Hyrule. This story moves at a brisk pace and allows for you to quickly learn the mechanics of the game and play through it. It’s highly advised you start with this mode. It can be played in three difficulties: Easy, Normal, and Hard with a Hero difficulty unlocked later. There’s also a Free Mode where you can replay the stages as any character. Next is the Adventure Mode. In the first game, this was one simple map where you complete specific tasks with various restrictions, unlocking characters, costumes and higher level weapons for your character. As this game includes all the downloadable content, there are now 9 different Adventure Maps of various different degrees of difficulty to complete. Many of these have their own gimmick such as the Termina Map, based on Majora’s Mask, which has a timer count down until the moon falls and resets the map while Koholint Island’s Map, based on Link’s Awakening, has you collecting the Siren’s instruments to stop nightmares. All the former downloadable content characters have had their weapons, items, and heart pieces intertwined into the maps, so they play out differently to the previous games. However, many of the characters still need to be unlocked from within the map. Make no mistake, this mode of the game will be the one that eats your time and it will take literally hundreds of hours to 100 percent, but I often found myself jumping back on when I had just finished something to do one more challenge. It is surprisingly addictive, but it is inherently grindy if you wish to progress through to the harder maps. You can’t just jump in straight away, else you will struggle. There’s a Challenge Mode which contains various battle challenges which have special tasks that you can complete with any character. More challenges unlock as you go through. There’s also a boss battle mode and another where you can play as the demon form of Ganon. There’s also the My Fairy mode, improved from the 3DS version with full 3D graphics, where you look after a Fairy you find in Adventure Mode, raising their level and giving them food and clothing. You can then use these companion fairies in the mode to get various boosts, making this fun to use as it can help you unlock the weapons and characters that you desire. The graphics of the game are solid. It runs at a solid frame rate, but with very few drops. This is despite the fact that you will often have over 100 enemies on-screen. The textures and areas aren’t very detailed, but that’s expected as the focus of the game is to plough through dozens of enemies without issue. It’s not the best looking game on Nintendo Switch, but what it does, it does well whether that be in TV or Handheld mode – although with slightly more pop-in when undocked. The locales match their reference game and help give you the feeling of being in that part of Hyrule. The sound is great. There’s not much voice acting in the story, going with the classic Zelda text boxes to follow how the franchise was before The Legend of Zelda: Breath of the Wild. Aside from that, it has the classic Zelda sounds when you find items, open a chest and it has some amazing remixes of various The Legend of Zelda music pieces. The Skyloft piece is one of the more notable ones, but the sound is just top quality. Even though you’ll be hearing the themes countless times if you intend to 100 percent the game, you won’t grow weary of them. Hyrule Warriors: Definitive Edition is a solid fighting game. It expertly meshes the gameplay of Dynasty Warriors and The Legend of Zelda with a decent story and a massive amount of content. It’s not perfect, but it’s a lot of fun and immensely satisfying to just plough through scores of enemies in a single hit. The story will keep you engaged and satisfied even if you don’t want to delve into the timesink that is the Adventure Mode. It’s definitely a fun game and this truly is the definitive edition. However, despite that, it lacks anything that’s actually new to this version. If you have the Wii U or 3DS game and bought all the downloadable content, then you’ll have seen pretty much everything that this game has to offer, so for that reason, it’s hard to recommend it. However, if you only played the Wii U version without the downloadable content, or you haven’t touched Hyrule Warriors before, this game is definitely worthy of recommendation.